I love handmade items from crochet items to beautiful DIY furniture projects. I wanted to try my hands in DIY furniture as I have a single bedside table which needs some makeover. So like many of us, I head over to Pinterest to find some ideas and I was awestruck by many IKEA hacks. This list has 10 such beautiful DIY IKEA Rust hacks that changed simple rust or a dresser to an elegant piece of furniture. These hacks are not only applicable to IKEA Rast but you can apply it on any piece of furniture. 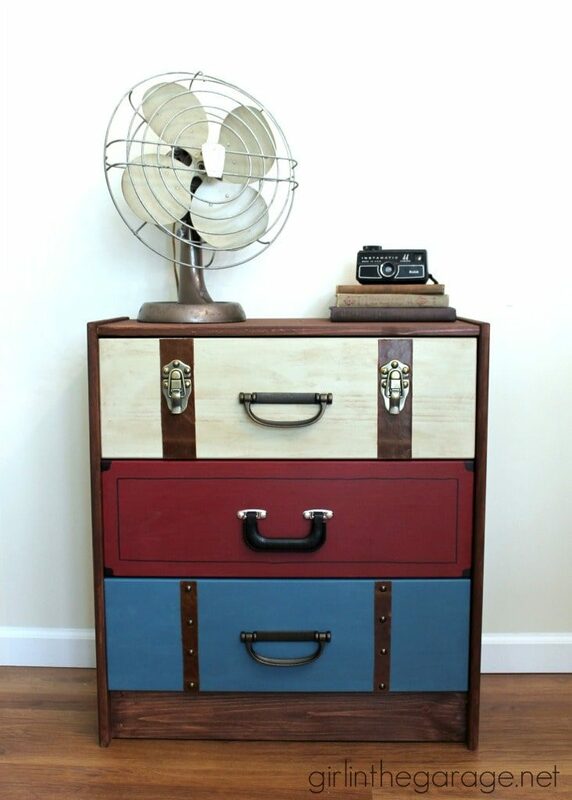 I love this suitcase dresser. Jen from GirlintheGarage has done an outstanding job and given us a glimpse of her creativity. This dresser in every way looks just like a suitcase. If you want one like this in your house then get the step by step instructions from Jen’s blog here. 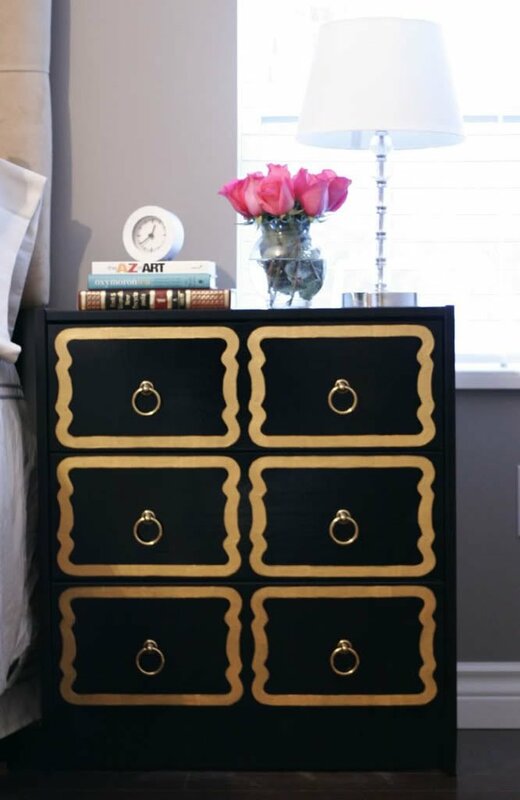 This luxurious looking dresser is created by Kelly from Jax does Design blog. I am sure anyone who looks at this dresser would not know that it was simple IKEA Rask in its former life. She has done a commendable job of transforming the IKEA Rust into beautiful high-end furniture. Check her blog for step by step instructions and the story she knits around this DIY project. I love her writing style. I found this beautiful dresser in Russian blog named Livemaster and the creator has done a great work of converting simple IKEA rust into this UK Flag dresser. Google will automatically translate the blog into English but if not then also DIY steps are pretty self-explanatory. I love the Pinhead around the border and it adds extra beauty to the dresser. This is an easy project, you can complete this project in an hour. 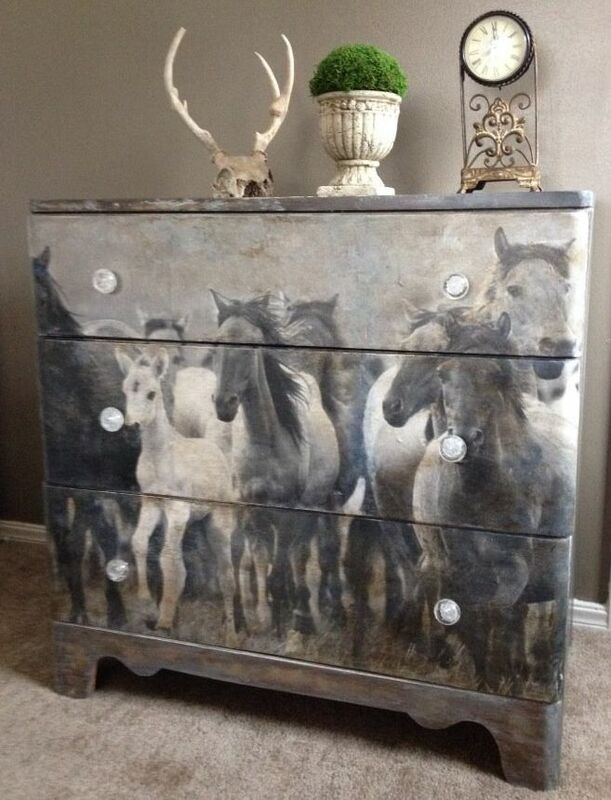 I love the idea of having my favorite image on a dresser. This is simply a very innovative idea and the fact that now we can do it too makes it a must try. Some of you must be wondering, why didn’t I think of it??? No worries, now you have so you can. Check the step by step instructions from HomeTalk website. This is another amazing DIY IKEA Rast hacks that transformed the ordinary IKEA Rast in a luxurious piece of furniture. I’m 100% sure that you’re guest will fall off their chair if you tell them that you made this beautiful dresser from an ordinary IKEA Rast. It’s simply unbelievable and the best part is, it’s very simple to do it. Check the full instruction at Marcus design. Even a beginner DIY enthusiast can do it. Looks like it’s my kind of project. What you say?? 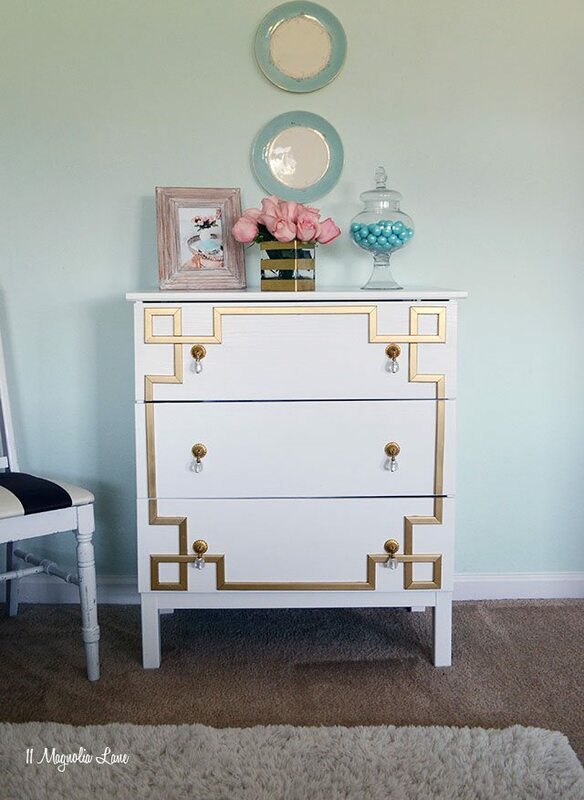 Christy from 11Magnolialane got inspiration from her gold Greek key monogrammed pillow to create this amazing dresser. Look how she converted a simple IKEA Rast into this high-end dresser. If you want this custom made dresser in your house then check her blog for step by step instructions. Christy did a Fabolous job here. Simply Beautiful! Head over to RestorationRedous for DIY steps top transfer your dresser or furniture to this beautiful piece. Shanna has done a fantastic job and the outcome is simply astounding. Silver bling color, crystal knobs, and the decorative piece cast an amazing spell on the ordinary IKEA Rast and changed it into this beautiful dresser. If you wanna know the spell that Shanna has cast on her IKEA Rast then please head over to her blog and learn it step by step. I love this idea of creating a custom bedside table out of IKEA Rast. 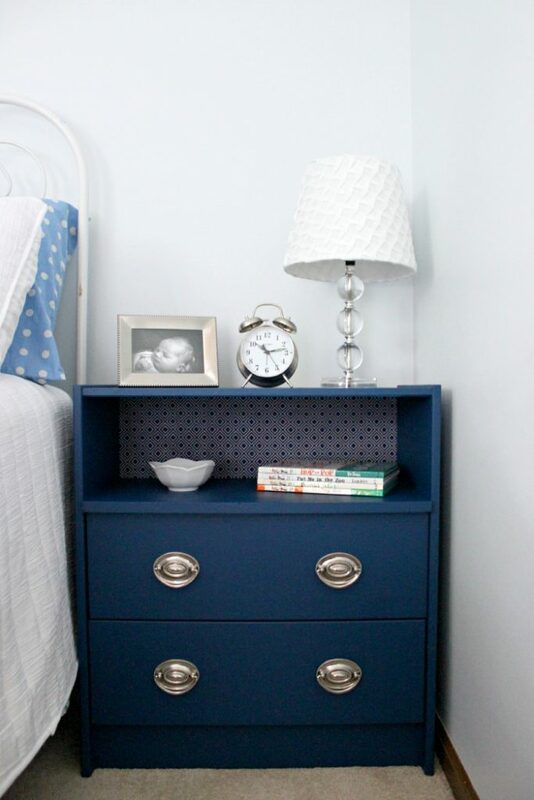 Lynette from CleverlySimple has created this custom bedside and you can do it too. She shares her step by step instruction in her blog. Go check it out and create a beautiful bedside for your bedroom. You can either use the same color as her’s or paint your favorite color. 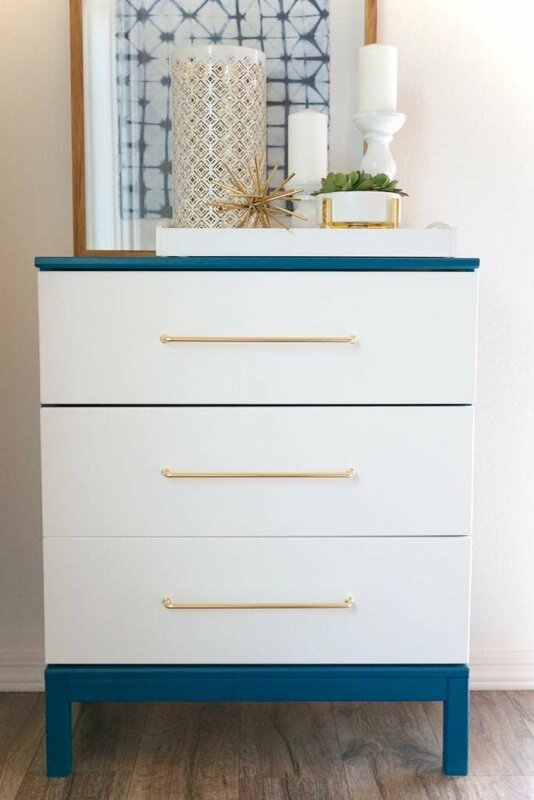 Rebecca from Make and Do studio has done an amazing job of transforming IKEA Rast to this elegant piece and the best part is it’s very simple to do it. You just need some paint and three brass handles and you’ll have a beautiful dresser. Check her blog for DIY IKEA Rast transformation here. There is no limit to what you can do it with IKEA furniture hacks. I am so blown away by all these beautiful DIY IKEA Rast hacks and their transformations. DIY Ikea hacks are so versatile and it proves that there is no limit to creativity. It’s simply awesome. If you like this post then please share it with your friends and family, on your social media, Pinterest, twitter etc. Follow me on Pinterest and like my Facebook Page for many other inspiring ideas. Join the mailing list. This is a really creative article!! Love me a good Ikea DIY! Omg I love these!! I got the Rast and put mirrors on it to make super gorgeous mirrored dresser. Good on you Victoria. That’s one more way to update the IKEA RAST.